Just a little grocery shopping trip this week. Well, this was a good week. Once again, with just a little planning, getting around without a car was pretty easy. For the most part, my meetings and errands were on a bus route. And the weather was good, which helped. 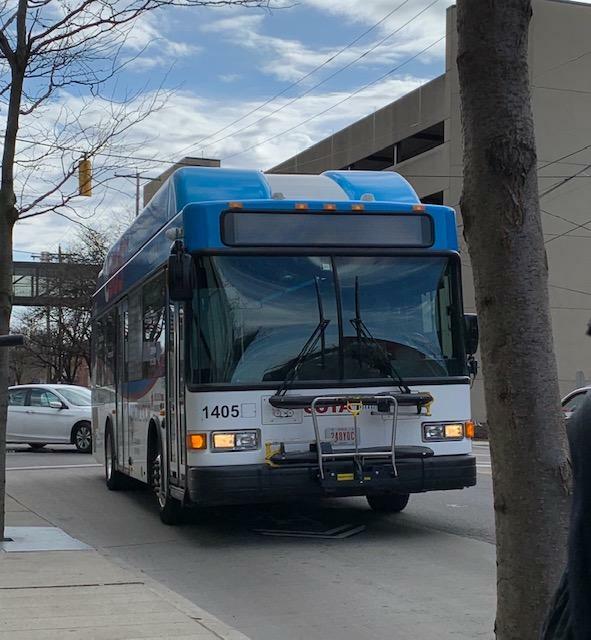 Just a quick shout-out to the Columbus Bus System (aka COTA – Central Ohio Transit Authority)… the CBUS Circulator — shown in these photos, is the “free” bus that moves people around downtown — from the Short North entertainment district thru downtown and South to German Village and the Brewery District. 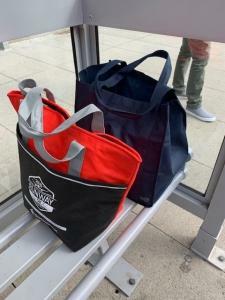 As much as it is good for tourists and students and worker-bees, it is also super helpful for those who need to go to the Kroger to pick up some groceries. Again, my eyes were opened on how many people actually shop at the downtown location and don’t drive to get there. Thanks COTA! Here’s generally how the conversation went — “I’m looking for information on Electric Vehicles or Plug-In Hybrids.” “Sorry, we don’t have any of those models here yet — later in 2019 (Subaru Crosstrek Plug in Hybrid– seriously, what took you SO LONG?? ), or “NO — Ohio isn’t a ZERO Emission State — we’re focusing on Western states and CA — (HYUNDAI KONA ELECTRIC CUV, range 238 miles — I CAN’T WAIT FOR YOU!!) . Chevy BOLT was cute — No Teslas at the show, but I hear they’re coming out with a Model Y CUV soon. Jeep/Ram? HAHA they almost laughed at me when I asked about hybrids. Nissan Leaf — they are coming out with a larger battery for longer range to compete against newcomers. Ford — we have nothing yet — 2020 will be a big year… ?? Eye-roll please. So again — the car market and electric stations to get consumers over the hump — we seem to be in a transition period for 2019. I applaud SMRT Columbus for pushing the Electric Envelope… it’s the only place in Ohio that seems to be focusing on the future so far. I expect to see big things in 2020. Episode 4 – March is Over!